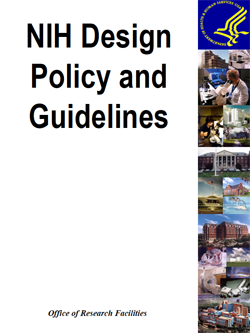 The goal of the NIH Design Policy and Guidelines is to ensure the quality of design and construction of NIH state-of-the-art facilities that are vital to the health care of all Americans. The material contained in this NIH Design Policy and Guidelines is the result of a partnering effort led by the Office of Research Facilities (ORF), Division of Policy and Program Assessment. Components within the Office of Research Facilities, Office of Research Services, Division of Safety, Division of Public Safety, and the Institutes and Centers of the National Institutes of Health were represented to provide input and expertise to this document. The 2003 NIH Design Policy and Guidelines represents a major restructuring and reorganization of the previous version of the NIH Design Policy and Guidelines. It incorporates feedback from a customer survey conducted during 2001, trends affecting biomedical research facility and animal research facility design and construction, and state-of-the-art technological changes. It also incorporates the NIH Planning and Programmatic Guidelines, resulting in a consolidated planning and design document for the NIH design and construction program.